It’s been a bit of a week… or two! Work has been sporadic and unpredictable, and rears its head at the most inopportune of times. I shot a friends EP launch, which resulted in 2500 (but who’s counting?) shots. All of which have to be evaluated, sorted, developed and fretted over. Terribly exciting for my friend, but probably meaningless for you. I did manage to get a little bit of personal shooting in. The immature red tail hawk, above, is one such shot. We already have Stonehenge, and Manhattanhenge. 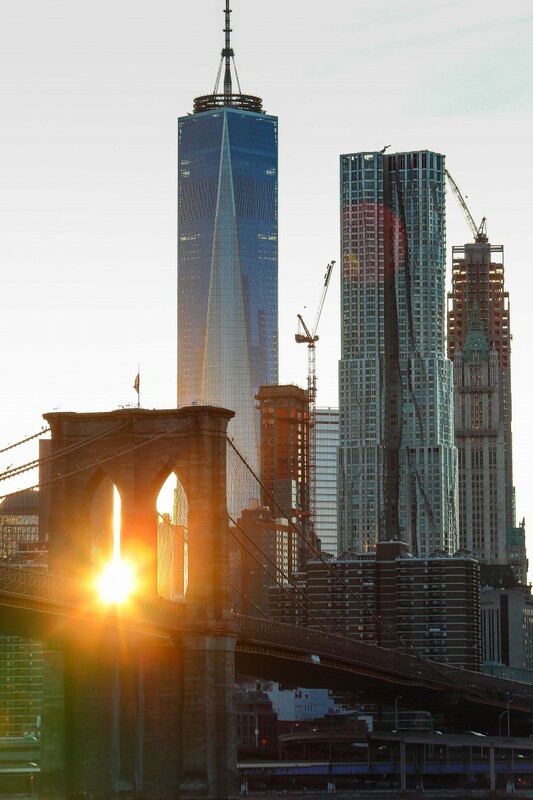 Brooklynhenge – those days of the year when the sun appears to set in either of the arches of the Brooklyn Bridge. And that’s just the western… um… abutment? I’m assuming that this celestial event isn’t merely limited to those few days a year, like the above aforesaid before-mentioned pretenders to the solar throne, but can in fact be viewed on many days of the year. Just get up off your duff, people, and move around a bit. You’ll find a good spot eventually. Why be a stickler for the details? Why limit yourself to just the ‘establishment’ dates of the solstices?